Several law clerks receive tutorials in Appellate Judge Joseph M. Bailey's chambers to prepare for the newly instituted Illinois bar examination. The evening sessions evolved into formal classes and, in 1888, the establishment of Chicago College of Law, the second law school in Illinois. Judge Bailey became the school's first dean. Emma Baumann graduates from Chicago College of Law, becoming the first woman to earn a law degree from the school. Ida Platt graduates with honors from Chicago College of Law, and soon becomes the first black woman admitted to the Illinois bar—and only the second woman of color admitted to practice law in the United States. She later helped establish the Cook County Bar Association, the nation's oldest African-American bar association. Appellate Judge Thomas A. Moran is named Chicago College of Law's second dean. Judge Moran became the first dean of Chicago-Kent College of the Law in 1900, following the merger of Chicago College of Law and Kent College of Law. Marshall D. Ewell founds Kent College of Law, named for Chancellor James B. Kent, author of the influential Commentaries on American Law. Ewell serves as the school's first and only dean. The first chapters of Lambda Epsilon, later Phi Alpha Delta, the world's largest legal fraternity, begin at Chicago College of Law and Kent College of Law. Chicago College of Law merges with Kent College of Law, to form Chicago-Kent College of Law. Thomas A. Moran of Chicago College of Law is named the new law school's first dean. Appellate Judge Edmund W. Burke is named Chicago-Kent College of Law's second dean. Judge Burke's son, Webster H. Burke, became dean following the elder Burke's death in 1918, serving out what would become nearly 50 years of continual leadership by the Burke family. Webster H. Burke '03 is named Chicago-Kent's third dean. He becomes the first Chicago-Kent alum to serve as dean, upon the death of his predecessor and father, Edmund W. Burke. The Chicago Kent Review begins continuous publication under the direction of Dean Webster H. Burke. Several years later, it adopted its current name, the Chicago-Kent Law Review. The publication began as the Anthenaeum Law Bulletin, one of the nation's first law reviews. Chicago-Kent purchases the building at 10 North Franklin Street, which serves as its home for the next 50 years. Chicago-Kent College of Law earns certification from the Section of Legal Education of the American Bar Association. The Student Bar Association, the law school's student government, is organized and affiliated with the Illinois Law Student Association and the American Bar Association's Law Student Division. Officers and student representatives are elected each year from the student body. Webster H. Burke steps down after nearly 30 years' service as dean of the law school. Donald Campbell '21 is named Chicago-Kent's fourth dean. William F. Zacharias '33 is named Chicago-Kent's fifth dean. 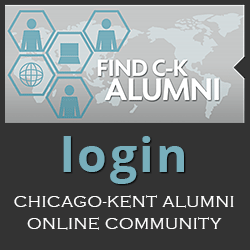 During his tenure, Chicago-Kent's Alumni Association was re-formed and the law school building remodeled, expanded, and made handicapped accessible. Fred F. Herzog is named Chicago-Kent's sixth dean. Chicago-Kent establishes its rigorous trial advocacy program. Students gain practical experience in litigation techniques under the tutelage of veteran judges and practicing attorneys, who lead small trial advocacy classes and coach student teams that compete in local, regional, and national trial competitions. The Chicago-Kent Law Review publishes the Seventh Circuit Review, a special issue focusing on the work of the U.S. Court of Appeals for the Seventh Circuit. The theme is revisited annually until 1989. Chicago-Kent faculty member Lew Collens is named Chicago-Kent's seventh dean. Collens serves as dean for 16 years before being named president of Illinois Institute of Technology. Chicago-Kent moves from 10 North Franklin Street to 77 South Wacker Drive. Chicago-Kent starts the nation's first in-house, fee-generating law school clinic, in which a faculty of practicing lawyers engage students to work on real cases under the discipline of actual practice conditions. In a typical year, clinical professors and students handle hundreds of cases in employment, criminal, health, and tax law. Chicago-Kent begins to offer continuing legal education programs to help members of the bar keep current on the state of the law. Chicago-Kent's Office of Continuing Legal and Professional Education now offers programs in a wide variety of areas, from civil rights litigation to taxation to labor and employment law. The Charles E. Green Lecture in Law and Technology is established to address the impact of technology on society, on legal relationships, and on methods of the study and practice of law. The lecture was named for Charles Green '15, who for served for many years as secretary and general counsel for Motorola Inc. The Kenneth M. Piper Memorial Lecture in Labor Law is established. The annual lecture brings together experts from labor, management, and academia to debate current topics in labor relations. The lecture was established by a gift from the widow of Kenneth Piper, a senior executive with Motorola Inc. and Bausch & Lomb Inc.
Chicago-Kent pioneers the three-year legal research and writing program, which is now emulated at law schools across the nation. To ensure personal attention, most writing classes have fewer than 30 students. The Moot Court Honor Society is founded to provide practical skills training in the foundations of appellate advocacy: brief writing and oral argument. Chicago-Kent fields a number of moot court teams that compete at the national and international levels in a variety of subject areas. Chicago-Kent and IIT establish a dual J.D.-M.B.A. program. The law school now offers many dual-degree options for students seeking cross-disciplinary education. 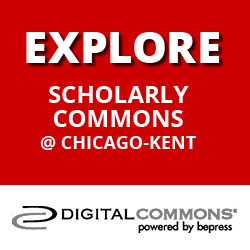 Chicago-Kent establishes the Center for Law and Computers, becoming the nation's first law school to make the computer an integral part of the study of law. Many of the applications of technology now taken for granted in the law school classroom were pioneered at Chicago-Kent. The Library of International Relations, one of the nation's most extensive repositories of international documents, announces its affiliation with IIT and its relocation to Chicago-Kent. The Chicago-Kent trial advocacy team of Joel Daly '88, Lauretta Higgins '88, and Peter Roskam '89 wins the national championship in the 13th annual National Trial Competition, held in Dallas, Texas. In addition to overall team honors, Peter Roskam was individually cited as Best Oral Advocate in the competition. Chicago-Kent establishes a chapter of the Order of the Coif, an honorary scholastic society that encourages excellence in legal education by fostering a spirit of careful study and recognizing students, lawyers, judges, and teachers for their scholarly or professional accomplishments. Chicago-Kent is named among the top "up and coming" law schools by U.S. News & World Report. The Norman & Edna Freehling Fellowship is established to promote the writings of professors who are in the early stages of their careers and have distinguished themselves through substantial and sustained scholarship. Richard A. Matasar, a federal jurisprudence scholar, is named Chicago-Kent's eighth dean. At the time of his appointment, Dean Matasar was one of the youngest law school deans in the nation. Chicago-Kent opens the "law school of the future" at 565 West Adams Street in Chicago's West Loop neighborhood, making the state-of-the-art building its new home. The Library of International Relations dedicates its new facility in Chicago-Kent's new building at 565 West Adams Street. The Governor Richard B. Ogilvie Auditorium, named for the 1949 alumnus, is dedicated at Chicago-Kent's new building at 565 West Adams Street. The Judge Abraham Lincoln Marovitz Courtroom, named in honor of the distinguished federal district judge and 1925 alumnus, is dedicated at Chicago-Kent's new building at 565 West Adams Street. Homer J. Livingston Jr. '66 becomes president and CEO of the Midwest Stock Exchange. Under Livingston's leadership to revitalize the organization, the exchange quickly reinstated its original name, the Chicago Stock Exchange, to help enhance its visibility in national and international financial markets. Chicago-Kent is named Public Interest Law School of the Year by the Law Student Division of the American Bar Association. The award salutes Chicago-Kent students, representing more than 10 law school associations and program, for donating more than 31,000 hours of volunteer service during the 1995–96 academic year. Lester H. McKeever Jr. '71 becomes chairman of the Federal Reserve Bank of Chicago, after serving two years on its board of directors. McKeever, who in 1960 became only the 61st African American in the country to be licensed as a CPA, held the post as board chairman for three years. Henry H. Perritt, Jr., an expert in information technology law, is named Chicago-Kent's ninth dean. Dean Perritt increased the law school's international reach though numerous interprofessional student projects, often based on using technology to foster the rule of law in emerging democracies. Chicago-Kent receives the E. Smythe Gambrell Professionalism Award from the American Bar Association for its professionalism program--an annual symposium designed to provide second-year law students with an opportunity to learn about the professional demands of the workplace from practicing lawyers and judges. Chicago-Kent and other academic units of IIT create the Institute for Science, Law & Technology (ISLAT) to evaluate emerging technologies and their impact on society. Central to ISLAT's mission: providing a forum for academics, practitioners,and policymakers at the intersection of science and law. Chicago-Kent launches the Honors Scholar Program to attract exceptionally talented and motivated law students who can influence and shape the profession's direction. Honors Scholars participate in special seminars addressing new frontiers of the legal system and produce a major work of scholarship in their third year. Chicago-Kent is awarded The Illinois State Bar Association's Access to Justice Special Recognition Award for initiatives that enhance access to the justice system for underserved and underrepresented populations. Chicago-Kent creates the Institute for Law and the Humanities. The institute's mission is to facilitate, support, and encourage symposia, lectures, scholarship, and faculty discussion on the relationships between law and other humanistic disciplines. The law school reduces the size of its entering class from approximately 400 to 300 students, resulting in enhanced selectivity. The smaller enrollment makes it possible for faculty members to give more one-on-one attention to students. The newly established Illinois Technology Center for Law & the Public Interest begins operations at Chicago-Kent. The center develops Web-based initiatives to increase access to the justice system for underserved and underrepresented populations. Chicago-Kent alums head the National Lawyers Association, National Hispanic Prosecutors Association, Illinois State Bar Association, Chicago Bar Association, Women's Bar Association of Illinois, Cook County Bar Association, Illinois Judges Association, and Black Women Lawyers' Association of Greater Chicago. Chicago-Kent establishes the country's first LL.M. program in international intellectual property law. The one-year program offers international and domestic lawyers an extensive education in all aspects of contemporary intellectual property practice. Harold J. Krent, an expert in administrative law, is named Chicago-Kent's tenth dean after serving as associate dean for five years and interim dean for one year. His scholarship focuses on the legal aspects of individuals' interactions with government, including issues of privacy, sovereign immunity, and separation of powers. The Chicago-Kent trial advocacy team of Keya Rajput '07 (Best Oral Advocate award) and Joshua Jones '08 wins the 32nd annual National Trial Competition. In 2008, Joshua Jones went on to become the first student to win back-to-back National Trial Competition championship titles. The Chicago-Kent team of Joshua Jones '08 (Best Oral Advocate award) and Mark Griffin '08 wins the 33rd annual National Trial Competition. The victory, along with Chicago-Kent's 2008 National Moot Court Competition championship, made Chicago-Kent the first school to win both competitions in the same year. The Chicago-Kent team of Lalania Gilkey-Johnson '08, Joanna Brinkman '09 and Rachel Moran '08 (Best Oralist award) wins the 58th annual National Moot Court Competition. The win, along with Chicago-Kent's 2008 National Trial Competition victory, made Chicago-Kent the first school to win both competitions in the same year. The Chicago-Kent team of Brody Dawson '09, Andrew Booth '09 and Betsy Gates '09 wins the 59th annual National Moot Court Competition. The 2009 victory, along with the law school's 2008 championship, made Chicago-Kent the first law school in more than 30 years to win the competition two years in a row. Chicago-Kent establishes the Center for Open Government, a pro bono initiative where students and faculty work to help ensure transparency, accountability and responsibility in state and local government. The Chicago-Kent team of Jeremiah Lewellen '11, Julie Levinson '11, Joseph Carlasare '12 (Best Advocate award) and Rachel Remke wins the National Institute for Trial Advocacy's Tournament of Champions. Invitations to this prestigious competition are given annually to only 16 law schools, based on their recent competition performance. The Oyez Project, a multimedia archive devoted to the Supreme Court of the United States and its work, moves to Chicago-Kent. 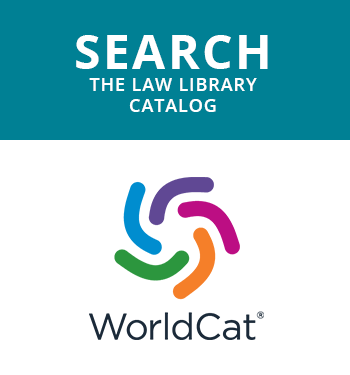 The site aims to be a complete and authoritative source for all audio recorded in the Court since the installation of a recording system in October 1955. Chicago-Kent establishes the Jury Center, a centralized resource providing information about the jury to academics, students, judges, lawyers and members of the press and public. Chicago-Kent establishes the Institute on the Supreme Court of the United States to educate internal and external audiences about the Court and its role in our constitutional system of government. The Chicago-Kent trial advocacy team of Emily Schroeder '15 and Nicolette Ward '16 wins the 40th annual National Trial Competition. In addition to overall team honors, Emily Schroeder received the competition's Best Advocate Award.